You may have heard of the Amish from the film “Witness”, starring Harrison Ford and Kelly McGillis. This is a work of entertainment and not a documentary of Amish life. You may also have heard that the Amish are "stuck in time," but this is not true, either, as you will see. If you have actually visited "Amish Country," then you may know a little more about these people. 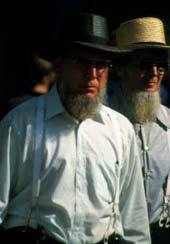 The Amish are not easy to get acquainted with because their religious beliefs require separation from the non-Amish world. 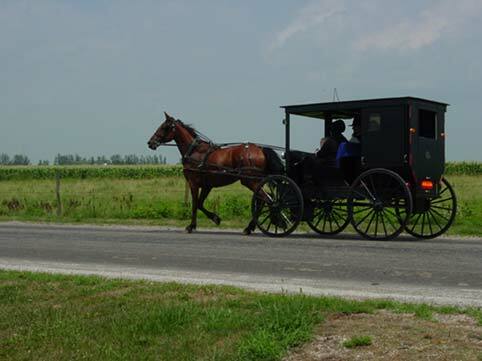 The Amish came into being in 1693 when a group of Swiss Mennonites led by Jacob Amman broke from the main body of Mennonites over differences related to the celebration of Communion (a remembrance of Christ`s last earthly meal). Facing persecution from both Catholic and Protestant Christians, Amish in large numbers eagerly took up William Penn`s offer of religious freedom in the American colony of Pennsylvania. Immigration to Pennsylvania began in 1727 and continued in earnest through 1770, settlement being concentrated in the Lancaster County area. The Amish do not have church buildings. Perhaps because of early persecution, the tradition arose of worshiping in the homes. The home that will hold services is selected on a rotating basis, so all homes are equipped for conducting worship services. You can identify these homes today by the large number of buggies present on a Sunday morning. The Amish settled into farming because this rural lifestyle made it easier for them to keep their distance from non-believers, referred to simply as "The English." Cities and towns have more of a tendency to become melting pots. As their numbers grew, Amish settlements were established in Ohio, Indiana and many other states, as well as in Canada. The establishment of new communities is ongoing. The Amish speak a Low German, similar to Pennsylvania Dutch, among themselves. High German is used for church services, and English is spoken with outsiders. The Amish believe in literal interpretation of the Bible. The Ordnung is designed to ensure that all members of the church live life according to the scriptures. A member of the Amish Church must live a simple life devoted to God, family and community, in accordance with God`s laws. Electricity, automobiles, television, clothing fashions and the like are considered to be disctractions that promote pride, envy, vanity, sloth, dishonesty and other undesirable traits. So what would you find in an Amish home? The home is one place that really hasn`t changed much since the 18th century, but then it is, after all, a refuge from the world. There are not a lot "things" sitting around. Furnishing and decoration would fall under the classification of "primitives," that is, functional and simply styled. Some of the appliances, such as a stove, may be a little newer, but there is no electricity to operate modern appliances. All lighting is by candle or oil and gas lamp. Bottle-gas appliances are acceptable, although bottle gas can be expensive. If you think about it, little more is needed in a place where you will eat, sleep, read, study the Bible and socialize with the family. Perhaps more than any other creation, "clothes make the man." This fact is why the Amish dress simply. It is how they acquired the nickname "The Plain People." Men wear black suits without lapels or buttons, shirts in white or blue mostly, black suspenders, black shoes or boots and broad-brimmed hats in black felt or natural straw. Women wear a frock type dress of mid-calf to ankle length with black stockings, an apron, black shoes or boots, black cape, and either a white "prayer cap" (if baptized) or a black hood. Solid colors only are worn, never prints, and darker colors are favored. One cannot give hard and fast rules on dress since there are numerous subtle variations from one community to the next. The idea is that the limited wardrobe eliminates the pride and envy that come with fashion, as well as wasted time (What will I wear today?) and wasted money (My clothes are so out of style!). Men wear cropped hair, and beards (if married), but no mustaches, as they associate mustaches with military officers. Women do not cut their hair, but keep it wound on the head and always covered once baptized.